Late February and early March led to the crowning of three Arizona Amateur Hockey Association state champions at the Tier II level. 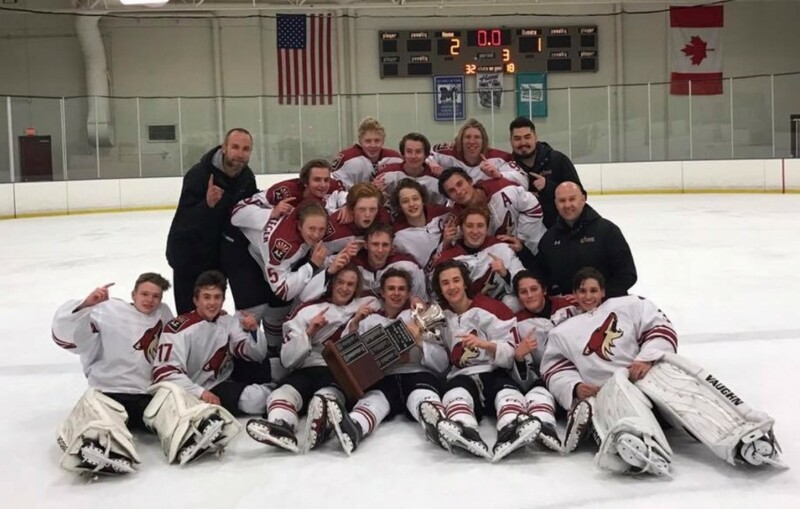 The Jr. Coyotes team out of Scottsdale claimed the 14U title, while the Jr. Coyotes, also from Scottsdale, captured the 16U championship and the DYHA Jr. Sun Devils skated away as 18U champions. 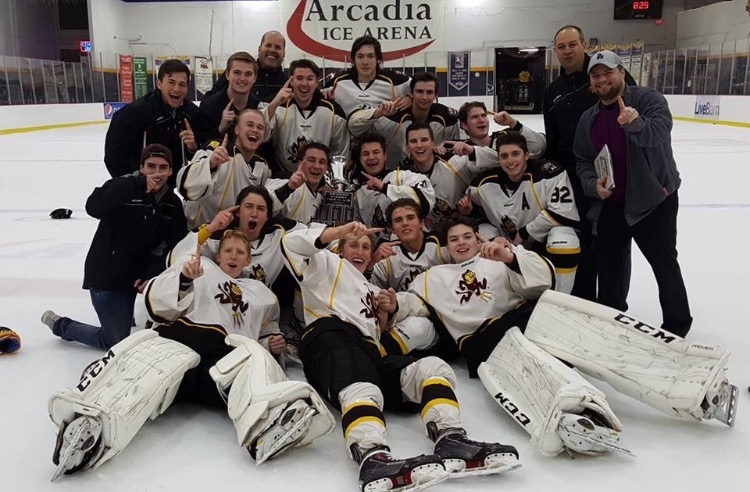 The 14U tournament, contested from Feb. 28-March 5 at AZ Ice Peoria, saw the Scottsdale club go undefeated with a 5-0 run to the title after preliminary round wins over the Jr. Sun Devils, the Jr. Coyotes 14U team out of Chandler and Mission AZ. 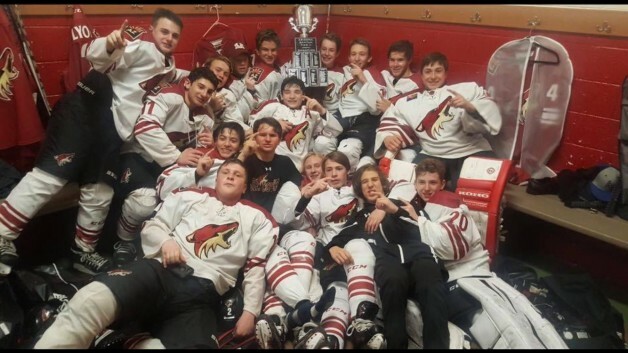 In the best-of-three championship series, the Jr. Coyotes and DYHA played two one-goal games, with Scottsdale coming out on top 2-1 in Game 1 and 1-0 in the clinching game. Ben Leshin scored the lone goal and Jonas Hamrin made 21 saves to pick up the win in goal in the championship game to send the Jr. Coyotes to the USA Hockey Youth Nationals from April 6-10 in Coral Springs, Fla. The Scottsdale Jr. Coyotes took after their 14U cohorts with the championship win at the 16U level. The Jr. Coyotes knocked off the Jr. Sun Devils 2-1 on March 7 at AZ Ice Gilbert as Grant O’Neal and Will Josephson scored to back Sean Slavik’s 17 saves in the blue paint. Taking a 2-0 lead into the third period, the Jr. Coyotes held off a late surge from DYHA after Josh Plunkett cut the lead in half late in the period. Jr. Sun Devils goalie Tristan Hadley stopped 30 shots in defeat. After the Jr. Coyotes took a 4-2 win in Game 1 of the best-of-three series, DYHA came back with a 3-2 overtime win in Game 2 as Andrew Suan was the hero. That set the stage for the thrilling Game 3. In the preliminary round, Scottsdale blanked the Arizona Hockey Union and also topped the Jr. Sun Devils and Mission AZ. The 16U Tier II USA Hockey Youth Nationals will be staged in Frisco, Tex., from April 6-10. At the 18U event, held Feb. 28-March 7 at the Arcadia Ice Arena, DYHA upended the Flagstaff Northstars in the prelims before going to the limit with Mission in the best-of-three finals, winning Game 2 by a 5-1 count and Game 3 in a 7-1 rout after losing 7-5 in the opener. The championship game on March 7 saw Ryan Bonner score three goals and Barrett Rosser make 34 saves to pick up the win between the pipes. Evan Shupe, Devin Most, Anthony Masanotti and Jeffrey Solomon also scored in the win and Turner Stansbury had a pair of assists for DYHA. Emmanuel Malki tallied Mission’s lone goal and goalie Jonathan Dinges stopped 16 shots. The Jr. Sun Devils now travel to Lansing, Mich., for the USA Hockey Youth Nationals from April 6-10.